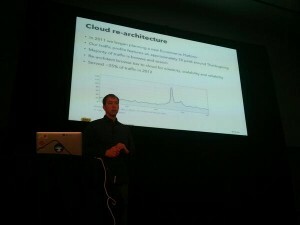 I will be presenting an overview of BestBuy.com’s cloud architecture at the SATURN conference at the beginning of May. It is generally an academic oriented conference so I’m glad they decided to hear about a real-life case study. Attend if you can! I’m not afraid to admit it, I have weird kids. I was a weird kid too so it is not surprising that my own are considered weird as well. How do I know they are weird? Lots of meetings with various school specialists in three different districts. My kids have been mentally poked and prodded for years trying to figure out why kids that tested out as very intelligent, were having such a hard time completing their school work. One of the psychological assessors tried hard to find words to describe their test results once and ended up with “unique.” Basically, the message was they don’t fall into any of the known psychological categories so their was nothing they could actually do to help them. Anyway, now that we’ve established they are weird, let’s get on to KhanAcademy ruining bedtime. In 4th grade, my son Alistair was finally challenged in math class (mentally challenged that is, not just challenged to get his work done). We had moved him to his third school in 5 years as each of the previous schools were unable to get through to him. (He’s in Minnetoka Minnesota school district now which is the most phenomenal school district ever in addressing individual kid’s needs). But he was finally challenged, and because of that he started asking me questions about math at bedtime. At first it was a couple simple questions and then we moved on to bedtime stories. After a few weeks he said “Let’s just talk about math instead of stories tonight.” Wow! As a engineer it was like music to my ears. So we talked about math most nights for a number of months. I would always ask him whether he wanted to talk about something new or something he was working on. New stuff was introducing summations, probability functions, imaginary numbers, and other fun topics for 4th graders. After a few months of this, we were introduced to KhanAcademy. I thought this was one of the coolest sites every and quickly got addicted to the math section myself. But to get my son’s interest I had to pay him to work on KhanAcademy for a few weeks until he became addicted himself. That’s when the problems started. The math questions stopped coming at bedtime anymore. After a few days I asked why we weren’t talking about math anymore? He said he didn’t need to ask anymore because he could just ask KhanAcademy. KhanAcademy is apparently better at teaching math concepts than I am. Bedtime had become less fun. Fast forward one year later. I found a piece of paper on his desk with chemistry equations written on them. I love chemistry as well and asked him if he had any questions about stoichiometry? He said no, he was learning it from KhanAcademy. Damn you KhanAcademy, you’ve ruined bedtime! Architect Driven Development, or ADD (just add the H in the appropriate place for most of us), is my new methodology of choice. In the large Enterprise context, where Agile is difficult to implement across many teams, ADD hits the gap by positioning the Architect to enforce the development methodology as well as the software architecture. Let’s face it, as Architects we end up being the people that, at least at first, are ensuring the development methodology is followed. In the Enterprise context where there are numerous teams spread across many mini-empires, one of the few roles that can be consistent is the Architect. In my role at Best Buy, I run a 70 person development team. That team is broken into eight different workstreams all lead by top tier architects. As long as the architect team is aligned on both a methodology and high level architecture goals, we get consistent results from our teams. It helps a lot that we all believe in Agile self-managed teams as it gives the developers the freedom to do the work how the team sees fit. But the architects carry the consistency through the development process from start to finish. There are also a couple hundred developers working on various parts of BestBuy.com that are not under architect control yet. These teams are largely driven by outsourcers who have a vested interest in keeping Best Buy architects away from their work. If we were there, they wouldn’t get to staff their $200/hr architect on the team or their 10 offshore counterparts. The problem here is the outsourced architect is not on board with our development methodology or high level goals, and given our structure there’s little incentive for them to even care. So as we strategized how to get better control over the dotcom platform, I put forth that as long as we controlled the architects and the process, nothing else mattered. Inherent in that control is control of resources as well. Since our hiring standards are tough, we only get top notch developers which makes everything else easier. But without a strong architect voice to push a methodology, pick resources and keep the architecture vision, the process would fail. Next time you are thinking about restructuring your development environment, stop thinking about what methodology you’re PMO is going to use and start thinking about getting strong technical architects to carry the vision and methodology. You’ll find that the rest of the process falls into place afterwards.